This page shows the overview features of Alio™ Typeface (fonts) from R9 Type+Design. Alio. Let Your Creativity Flow. Inspired by sleek sans serifs and flowing cursives, Alio™ features the best of both worlds. The hybrid modular design gives you tons of alternates and options to play. Just let your creativity flow and enjoy creating a broad range of styles from minimalistic modern to decorative flourish. 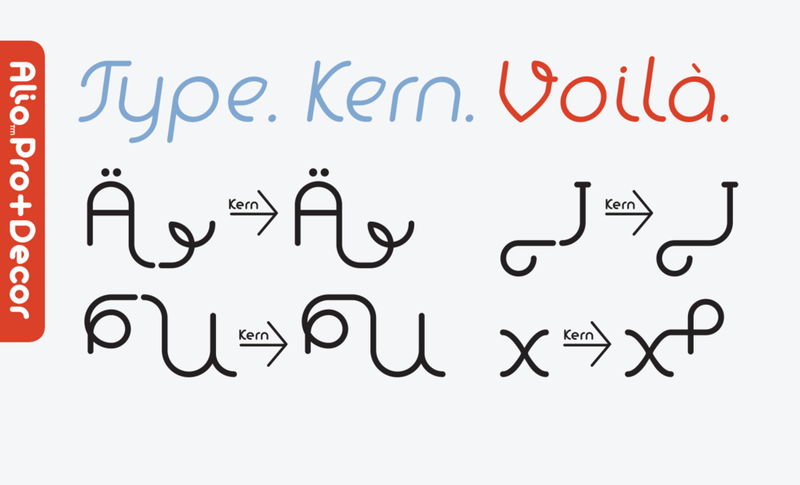 Alio Std features selected glyphs from Alio Pro (fewer ligatures and alternates). Perfect for web headlines and subheads, and minimalistic, modern print designs. [6 weights/12 font style, 400+ glyphs each]. Lots of Glyphs. Tons of options. Uniquely drawn yet compatible Roman and & Italic characters give you even broader range of options to play. Kick your styles up a notch with Alio’s extensive set of ligatures. Use them on logos, posters, packagings or even social media posts. We baked in some UX design. We make sure that a wide variety of Alio Decor glyphs lines up with the cap-height, x-height, baseline, and descender height wherever possible. So you can just type, kern, and voila. We meant it when we told you that Alio supports most Latin-based languages. We make designers’ lives just a bit easier. We provide five alternates each (two for Alio Std) of the registered, trade, copyright, published, and service marks. Say goodbye to superscript and baseline shift the type. You can easily experiment with Alio’s OpenType features to achieve the looks you love. And unlike plastic surgery, it's 100% reversible. Love it. Buy Alio now. Alio Text does not only look great as a display type, but also it has been optimized for the high legibility and readability at small sizes. The Text family features taller x-height, wider letter spacing and more pronounced accents than the Pros. We also cut down from 6 weights/12 styles to 4 weights/8 styles to maximize the weight contrasts in small type. Whether your designs call for all caps, title case, sentence case or all lowercase, Alio Text has got you covered with the case-sensitive punctuations. No more baseline shift all your punctuations. Alio Text packs with Open-type features. 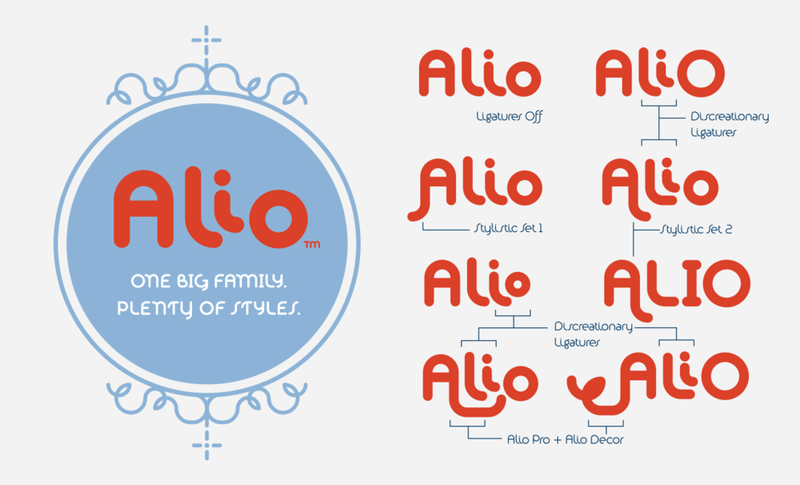 Many of which are shared with its siblings, Alio Pro. Here are a few examples, both the Text and the Pro recognize fractions vs. dates. Both features several alternate legal symbol positions (3 in Alio Text; 5 in Alio Pro). Love it. Buy Alio Text Now.